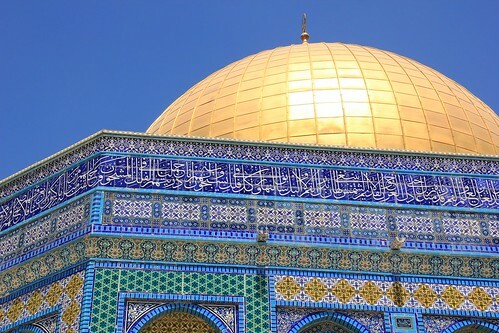 The Dome of the Rock, in Jerusalem, is particularly gorgeous because of its vibrant tile-work in the midst of the white stone buildings that surround it. We’re always blown away by the tile and mosaic work that is common in Islamic architecture, and this is one of the few buildings that is decorated on the outside just as intricately as most others are on the inside. 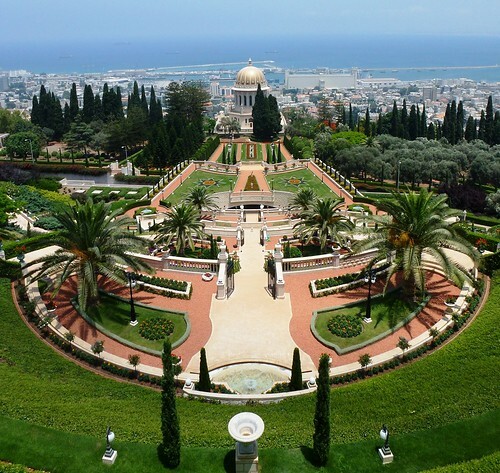 The Baha’i Gardens in Haifa, Israel surround the Shrine of the Bab, the resting place of the Prophet-Herald of the Baha’i faith. There are 19 separate terraces of gardens, stretching from the foot of Mount Carmel to nearly the top. There are only 3 sections that are open to the general public without a guide, and while they are lovely, they are very small. We decided to take the hour-long free guided tour so we could walk through the entire length of the garden, and that proved to be a fantastic choice. Our guide was very informative regarding the origins of the Baha’i faith, and we learned quite a lot about the foundations of the faith, and the basic beliefs of its followers. 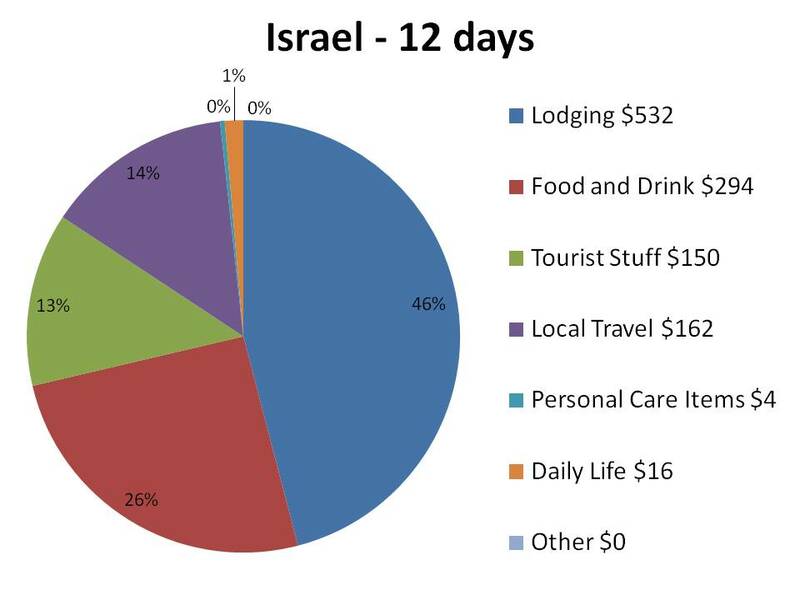 Most expensive lodging – Our Airbnb stay in Tel Aviv was $33.50 per person, per night, but it was well worth it since two beds in a dorm room there would have been only slightly less. Through Airbnb we were able to stay in our own air-conditioned room, in a fantastic area, in the apartment of a lovely couple who helped make our time in Tel Aviv so much better than it would have been on our own. Least expensive lodging – $15.75 per person for a dorm bed at Corrine Hostel. It’s got some crappy reviews on the hostel sites, but we didn’t think it was that bad. Average food/drink cost per day, per person – $12.25 We had to really cut back on the food spending to compensate for the cost of lodging. This doesn’t mean we ate less, it just means we didn’t go out to restaurants generally. It’s super easy to grab cheap and filling shwarmas and falafel all over the place. For dinners we mostly cooked for ourselves, which really means we ate hummus and pita by the kilo, and went to the market for fresh tomato, cucumber, cherries, apricots and olives. It was fantastic. 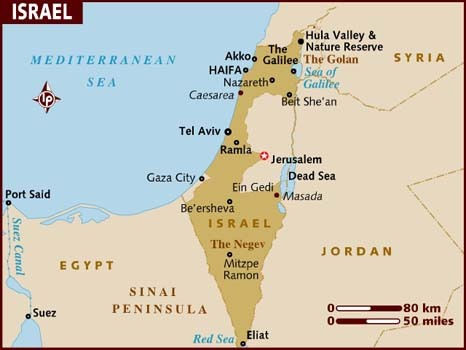 Yad Vashem Holocaust Museum in Jerusalem – This is the world’s largest Holocaust museum and memorial. We went on a Friday morning since it was one of the few tourist things open on Friday, and our biggest mistake was not giving ourselves enough time. We spent nearly 3 hours here before we had to leave because the museum was closing, and we could have spent easily twice as long. It’s the most organized and thorough museum we’ve ever been to. There are dozens of short video narratives given by a number of survivors, and those were really the highlight for me. Their stories are incredible and heartbreaking. In addition, the museum has amassed a huge collection of person items salvaged from the camps, or thrown from the trains that took the victims to the death camps. They do a very good job of bringing light to so many individual stories, as well as providing a thorough historical overview. Give yourself twice as much time as you think you’ll need, and bring a package of tissues. 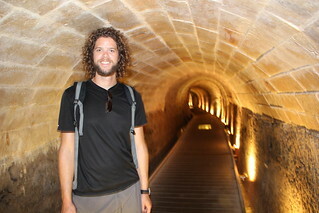 In Akko you can visit ancient underground tunnels that were only recently re-discovered! Akko – A smaller city north of Haifa that not as many tourists include in their plans. Akko has a lovely old city that’s really worth visiting if you’re in the area. We went for most of a day as a side trip from Haifa and had plenty of time to see most of the old city. We also had some fantastic falafel from a street vendor there. 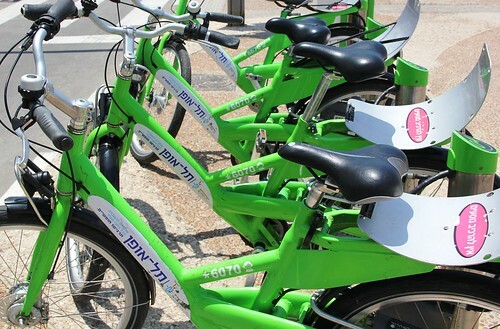 Green Bikes in Tel Aviv – Tel Aviv has recently implemented a new bike rental system similar to what London has done. There are bike stands set up all over the city and you can pick them up and drop them off at your leisure. You can rent by the day, week, or month, and it’s very affordable, even on a tight budget. For less than $5 each we were able to pedal all over the city! 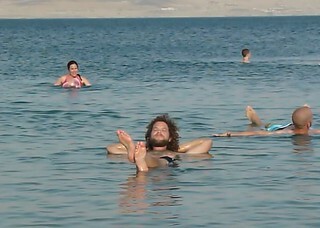 Taking a dip in the Dead Sea – Incredible! We had read all the stories about how you simply can’t sink, but to experience it for ourselves was so much better than we anticipated. You really can’t sink! We had a blast covering ourselves in the mud and watching crazy lines of salt dry on our skin. Eilat. We had heard that Eilat was fantastic from a number of people, but honestly, we weren’t impressed. We snorkeled one day, which was nice, but other than that, we found it kind of ‘meh’. It’s a good stopping point if you are travelling between Israel and either Jordan or Egypt, but we didn’t need more than a day there as there’s not a whole lot going on and the beaches aren’t anything to get excited about. 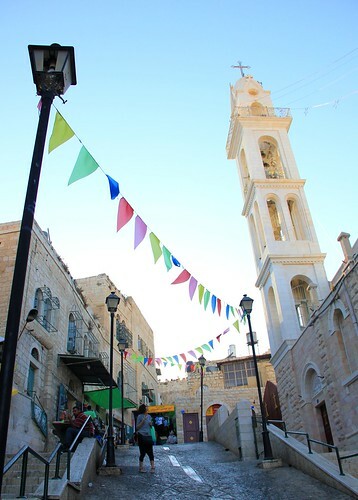 While we were in Jerusalem, we thought we’d take a little dip into the Palestinian Territories to visit Bethlehem and the Church of the Nativity. We took a local bus, which dropped us off just outside the center of what is now quite a bustling little city. As we made our way through the markets and down to Manger Square, we came across this lovely little road. Contrary to what the news might have you believe, there are at least parts of the Palestinian Territories that are perfectly lovely, and this is one of them. The town’s building are made almost exclusively with the same beautiful white rock as in Jerusalem. The streets are clean, and the people were very kind. We had no trouble finding our way to the church and even stopped to have a beer at a little cafe on the way back to the bus. The day definitely helped to remind us that while things make the news for a reason, a place can’t be defined only by what you see on the television. Local markets are probably my favorite place to spend time in a new city. You can learn an incredible amount about local culture by wandering around the market and seeing what’s for sale, which usually includes everything from local produce to local fashion. 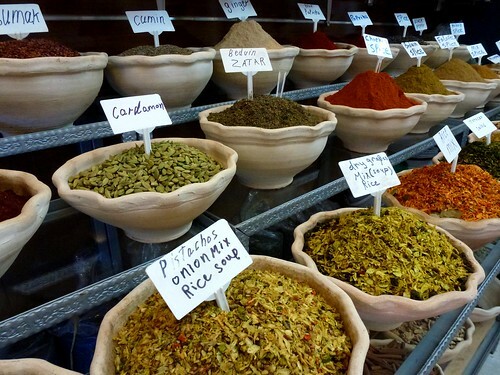 Jerusalem’s old city has an extensive market. Parts of it are geared nearly completely to tourism and you’ll find stall after stall of t-shirts, rugs and trinkets, BUT, if you wander off a bit down the side streets you’ll encounter the local market stalls. We passed this vendor selling spices, clearly still close to the tourist center as the labels are in English, and the smells were intoxicating. I want to bottle it up and be able to take it with me…perhaps a new flavor of scratch-and-sniff is in order?